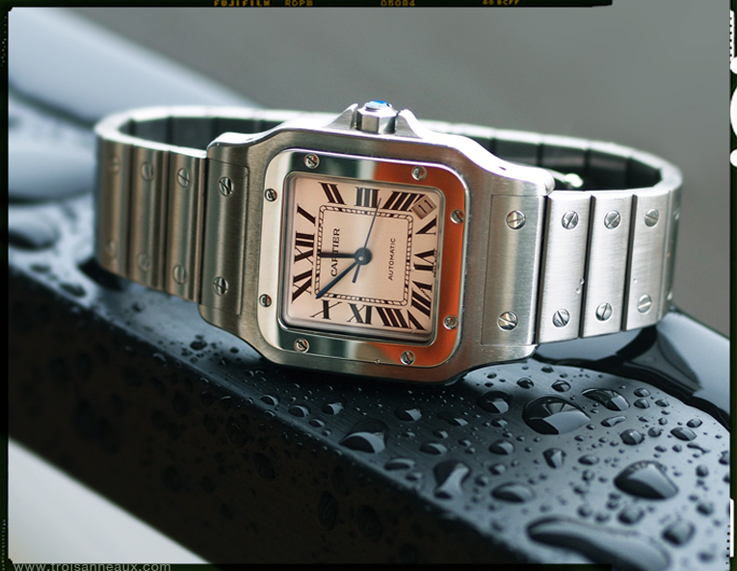 While I was doing my run on the treadmill, I realized that the Santos de Cartier, may be one of the most recognizable watches, is this year 35 years, non stop, in the collection and is still going strong. Initially inspired by the Santos Dumont, ‘the Santos’ as it was called at the launch in 1978, took the lead and won the hearts of a wide audience, from younger to older people, from sports to business men, the Santos was the was the watch to have. The Santos was released as one of the first watches in steel and yellow gold, at that time a daring combination and later presented in all steel. 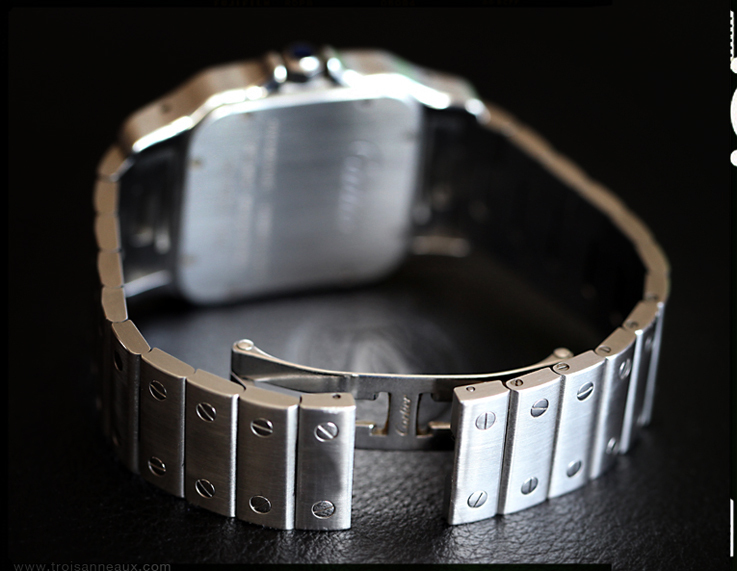 Case dimensions were 41 x 29 mm and the watch had a small square buckle with double C’s, to close the bracelet. Since the 1978 until now, we have seen many variations, also with quartz movements, applied numerals, all steel, all gold , white dials, colored dials and the last models had a slightly curved case and quartz movement, but all of them still very recognizable Santos and all with the same dimensions. At the end of 2005 the model was revised and re-launched. The case was enlarged and is now 45.5 x 32 mm, the buckle on the bracelet has gone, so there is a really cool blind closure now. 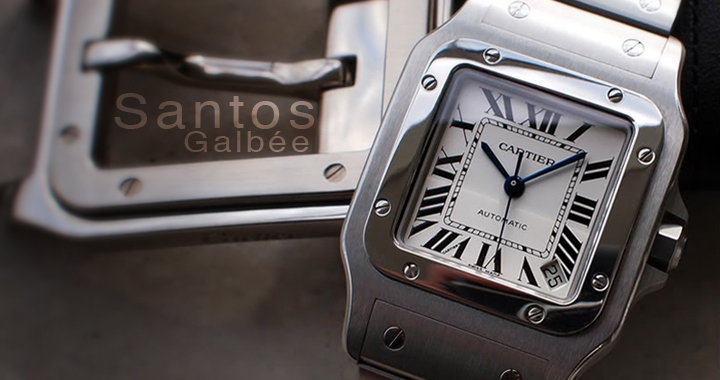 The original model, was thin on the sides but had a bolder back, because of the automatic 077 caliber, the current Santos, officially called Santos Galbée now, has a curved and flat case, large enough to house the 049 caliber. One of the major visual improvements is the date window, it’s now located between the IIII and the V and not occupying the numbers III or VI anymore. 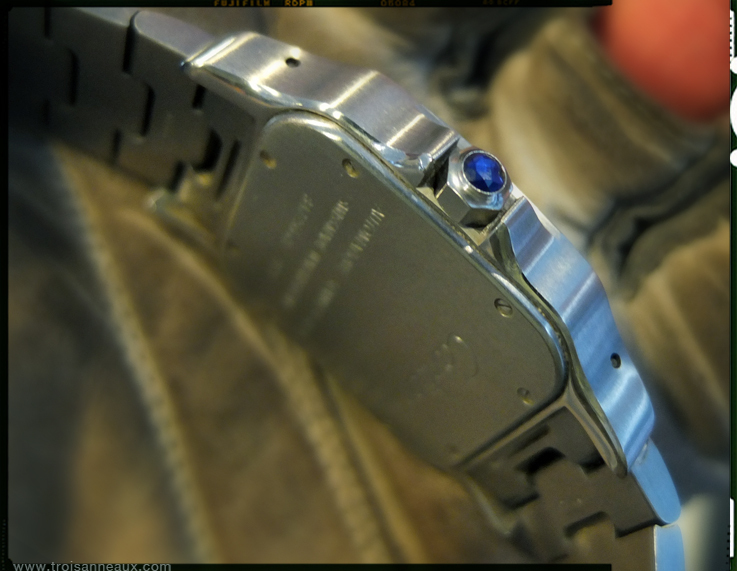 While the watch is called XL, the dimensions are very modest and just right for a mens watch. 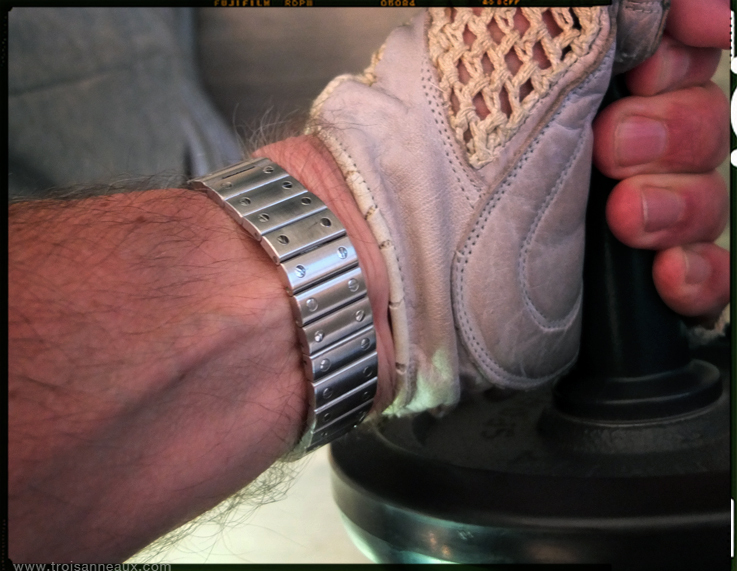 Personally I really like wearing watches with metal bracelets, be it gold or be it steel. In warmer climates, sports, in and around the pool, they are just very convenient and comfortable to wear. 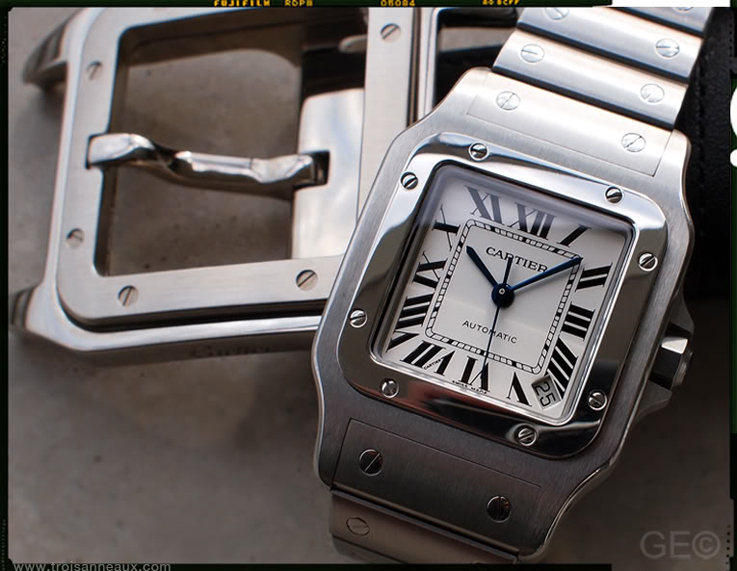 The Santos Galbée XL is a very strong and stylish mainstream watch, with a very good and reliable ETA caliber, that retails for around US$ 5900.- Hopefully there will come a day, that Cartier will revise the model again, with an in house automatic caliber. Bringing this model to a higher level, will only do justice, to what this watch is and to what it has achieved, during it’s career of 35 years.